Bombardier’s turnaround has become and asset sale, $300 million for its DHC-8 line (100/Q200/Q300/Q400) to Longview Aviation Capital/Viking Air, $650 million for its Business Aircraft training business to CAE, $561 million for Downsview Airport and factory, so $1.5 billion in asset sales as it lays of another 5,000 employees. I said for years, the CSeries, Q400 and CRJ were heading off the cliff, the realization came this year, as they dumped the CSeries on Airbus, giving away 50.01% for Free, paid $609M so far in costs, kept 33.55% and gave Quebec just 16.44% for its $1.0 billion bailout in 2015. As well, Bombardier will provide a maximum $925M in loss guarantees to CSALP to 2021 and a final assembly line in Alabama? In the end all A220 assembly will go to the US. As for Q400 and the CRJ, they are “walking dead” programs, like the A380 and B747-8i, the Q400 has 66 in backlog, 32 orders this year, I count 21 orders, either way only 9 delivered in 9 months, 1.0 per month seriously? so 66 months to deliver all 66 in backlog? CRJ has 56 in backlog orders, yet only 14 delivered in 9 months, just 1.5 per month? The program lives of US regional airline orders, as the pilot scope clause allows only the CRJ900 and E175, so hate it or not, you order the CRJ900, but E175 has had 80% of US orders the past few years, and when the MRJ and E175-E2 enter the market, its all over for the CRJ program. Bombardier is on its way out of the Commercial Aircraft Business, it has crewed up royally, it went into the CSeries program blinded by marketing myopia and BS about the market, its forecasts were “fantasies” that went against all reality on the ground, it let ATR beat the Q400 and the CRJ was always doomed as a stretch of a business jet, and now with the MRJ and E2, it is obsolete and no interior modification can fix that. STRIKE 3 – CRJ PROGRAM AND YOU ARE OUT OF THE COMMERCIAL AIRCRAFT BUSINESS! This is it, strike 2 on Bombardier Commercial Aircraft, strike 1 was the CSeries, strike 2 is the Q400 being sold to Longview Capital/Viking Air with just 66 orders in backlog and a production rate of 1.0 per month? and now just the CRJ remains, and then strike 3 and THE END of commercial aircraft production at Bombardier by 2021 at the latest, as CRJ orders are minimal, 10 last year and 34 this year, with production now at just 1.55 per month, its a “walking dead” program like the Q400, A380 and B747-8i, all about to expire in a few years time if demand does not increase. BCA (Bombardier Commercial Aircraft) is now known as Regional Aircraft Division after the desperate fiasco to get rid of the so-called “game changer” CSeries to Airbus, which received 50.01% of the program for Free, a final assembly line (FAL) in Alabama for FREE and funding for CSALP (C Series Aircraft Limited Partnership) of up to a maximum of $925 million between 2018 and 2021 to cover cash shortfalls, proportional to the ownership, 50.01% Airbus, 33.55% Bombardier and just 16.44% for Investment Quebec. 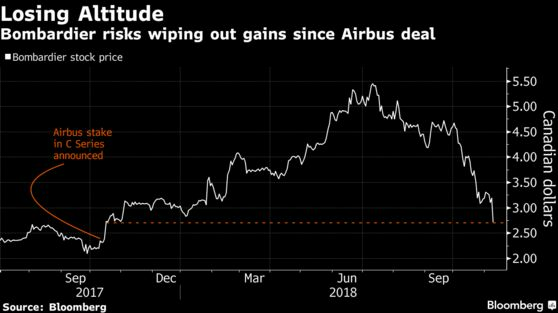 Bombardier took a $US 609 million hit so far in 2018 on the Airbus deal. Airbus is responsible for 1) sales & marketing support services for the A220, 2) management of procurement, including leading negotiations to improve CSALP level supplier agreements, 3) customer support for the A220 program. But gained $US 561 million from selling Downsview Airport, I should add Bombardier bought de Havilland in 1992 for $100 million for the airport and the DHC-8 program (100/200/300), now it sells the whole DHC-8 program (100/Q200/Q300/Q400) for $300 million to Viking Air, so what it bought for $C100 million it now will receive $861 million an 761% return in 26 years! around 8.5% CAGR since 1992 on the airport and DHC-8 alone, never mind the profits from the DHC-8 program, thank you Quebecois Prime Minister Mulroney and Canadian taxpayers. The same ‘scam’ was done on Canadair in 1986, when Bombardier bought Canadair and Cartierville Airport and the CL-600 Challenger business jet program and the CL-215 water bomber, this was the beginning of Bombardier Aerospace, price tag was $C 120 million, by 1988 Bombardier moved operations to Mirabel Airport and sold Cartierville to real estate developers for a reported $600 million, a nice return on investment in just 2 years? it has been the classic Government/Bombardier scam on Canadian taxpayers, low cost for the OEM’s with hidden value in assets. Prime Minister Brian Mulroney in the interest of Bombardier and Quebec also threw in the maintenance of the Canadian CF-18’s which was given to Bristol Aerospace in Winnipeg, but once again in the name of Quebec scrapped that deal in favour of Quebec and the building of its industrial champion, Bombardier! which he championed so hard for, of the backs of Canadian taxpayers. Canadians have been screwed by politicians kissing up to Bombardier since the 1970’s first with trains and then from 1988 with planes to create the world’s only manufacturer of planes and trains. So here we are November 2018, and today we received the 9 months financial report from Bombardier, the news today of the of the sale of the DHC8 program to Viking Air for $300 million and the sale of the Bombardier business flight and technical training to CAE for up to $800 million, netting around $650 million for Bombardier, including 5,000 job loses has been badly received by the investment community, the stock BBD.B dropped 24.4% at one point. To most observers its a failure by CEO Bellemare to fix Bombardier, no turnaround of the CSeries, but they sure got paid well for nothing! and now just a sell-off of assets, and bring the company down to just trains and business planes. I have been an outspoken critic of Bombardier since I saw that the CSeries was going to be a disaster in the 100-150 seat segment of “doom” following the A318 (80 deliveries), B737-600 (69 deliveries) over the cliff, but marketing “myopia” got a hold of Bombardier, they loved their “game changer” it was going to be big, BUT they knew nothing of history and the what was happening in the airline industry as airlines up-gauged and wanted nothing below 150 seats, and they blew $6 billion on a program that even today is struggling with sales and still most likely will end up a commercial failure, with 402 orders, but around 152 ‘iffy’ or ‘BS’ orders like Republic, Odyssey, Gulf Air, Iraqi, SaudiGulf, etc. so in fact maybe only 250 orders, 45 have been delivered , so 205 in backlog? might be. So what news did I learn today? Let’s look at the Q400 since its sold, it has been a big success, but not anymore, 646 orders out of 1,317 DHC-8’s (49% of total), 580 delivered, with 66 now in backlog, but some BS in their numbers. Bombardier claims 32 orders this year in the first 9 months (vs 38 in 2017), 3 x Biman Bangladesh, 4 x Undisclosed (Chorus? ), 10 x Ethiopian, 4 x Conair (Water bomber conversion) and 6 x African Aero Trading (Angola), that makes 27 orders in my book, and they are falsely using the 6 aircraft order for African Aero Trading that Angola’s President João Lourenço called “fictitious’ a scam by a company that does not exist! of course its a “middleman’ deal, meaning someone profits from the deal big time! Bombardier should have known that, typical unprofessionalism. So I have just 21 orders to the backlog should be just 55? anyway, Bombardier delivered just 9 x Q400’s in 2018? 1.0 per month? (2.5 per month in all of 2017, or 30 in total) says it ALL no hurry to put out aircraft? a cut in production of 60% from 2017, why? No confidence in future sales? if they have 66 orders in backlog would they not want to clear them in less than 66 months? Now, the CRJ, which also struggles for orders, in fact, it’s orders are from US regionals who already have the CRJ900’s and because of pilot scope clauses, the E175-E2 and MRJ90 do not fit into the clause (76 seats, 86,000 lbs MTOW), US regionals can buy CRJ900 or E175-E1 only, and many more are buying the E175 the last 5 years, in fact almost 80% market share for the E175, but for those that have the CRJ900 they come back for more, for now until the scope clause change, a sad situation for the US regional airlines, buying something you really don’t want to but there is little choice, as you see in Graph below Bombardier market share was downhill from 2003. So far this year 34 x CRJ900 orders (and 6 cancelled CRJ700 orders – of course), 20 from Delta Air Lines and 15 from American Airlines and then 4 for new state-carrier Uganda Airlines, but it did not get EDC export financing so on hold?. Bombardier’s Regional Aircraft revenue for 9 months stands at $1.335 billion with EBT at a minus $737 million ($589 million special item deductions, in short CSeries costs). It is a boost from 2017 when just 10 x CRJ900 orders came in, but again some BS, they have delivered just 14 so far this year (1.55 per month) down 30% from 2.2 per month in all of 2017 (26 in 2017). If you really have a backlog of 56 CRJ’s today (1 x CRJ700, 5 x CRJ1000, 50 x CRJ900) why are they pumping out 1.55 per month, at this rate, it will take 36 months to clear the miserable backlog of 55! will DL and AA wait 3 years? I don’t think so, and Bombardier has been talking about increasing the rate but only 3 in 3Q/2018? Either way, I don’t care, Bombardier is in a slide out of the Commercial Aircraft business, they stretched the DHC-8-100 into an 84 passenger Q400, they stretched the CL-600 into a 104 seat CRJ1000, great job at stretching, but it cannot stretch anything anymore, it is done for, just when not if. Look at it this way, NO commercial aircraft OEM can succeed at production rates of 1.55 or 1.0 per month, yes Airbus A380 and Boeing B747-8i are at those low rates, but they have other products to make money with, Bombardier’s only 2 products are in total at a production rate of 2.55 per month in 2018, just get out of the business, its sad to see a slow death and listen and read the BS about improvements and enhancements, its all BS, few airlines want the aircraft today, there best days are behind them, and the sunset is fast approaching. Bombardier has failed in the Commercial Aircraft business the past 10 years miserably, it did well in the 1990’s but basically when Pierre Beaudoin came on board as CEO, it all started to go badly, and now its just a matter of time for the CRJ line, as soon as a new pilot cope clause comes in around 20121-2023, its over, for the stretched Canadair CL-600 derivatives, 40+ years on, the end is near. As for the Business Aircraft, Bombardier delivered in 9 months, 9 x Learjet 70/75 (-3 on 2017), 40 Challenger 350 (+6 on 2017), 18 x Challenger 605/650 (+3 on 2017), 29 Globals (-3 on 2017). The future is the $73M Global 7500, if that goes like the CSeries, Bombardier is in trouble, Learjet is next on the chopping block, hell 1 aircraft per month? Challenger 605/650 is 40+ years old, G6500/5500 are being challenged by Gulfstream’s G500/600 and its heads or tails on the G7500, yes some early orders, but the Globals will never reach their peak of 80 deliveries of 2014. This year maybe 40 will be delivered, and then from 2019 G7500 production should be 15-20 and in 2020 30 to 40, but what about the old G6500/5500 now refreshed from G5000/G6000, all the same CL-600 airframe just like CRJ’s just stretching and stretching and it is not a competitive cabin anymore after 40 years. The backlog is $14.3 billion, but business jet backlogs are BS, “garbage” info, unlike commercial aircraft where individual airline orders are made public, business jet backlogs are “highly” dubious figures by all OEM’s, lots of “smoke and mirrors”. So far this year business jets have a revenue of $3.5 billion ($2.617 billion from manufacturing and $883 million from service) and EBIT is $285 million, 8.1%. Today, Bombardier is building up lots of cash with all these asset sales, $300M for DHC-8 program plus $650 million net on the CAE training deal, plus $561 million for Downsview Airport, and you have $1.5 billion in fresh cash from asset sales, factory, airport, aircraft program, training, it is selling assets as it still has $9.0 billion in debts, which so far this year has cost it $465 million for finance costs. Read the June 29, 2016 article on the Rise and Fall of Bombardier, which I wrote with my old friend Peter Hartmann (ex-Canadair, de Havilland, Bombardier Airline Analyst, Aerospace Engineer), who sadly passed away this year on February 8th after a long battle with cancer, he was my mentor at de Havilland and he is missed dearly. Read the Bloomberg article interesting read below, nice to see someone knows Bombardier well, local papers here are oblivious to its plight still. « “We are open to offers for new airline”​? Ghana’s Aviation Minister Joseph Kofi Adda. Is Ghana ready for a third attempt at a national carrier?